In true Bluespoon fashion, we’re always looking for new ways to arouse our fans. In continuance of the no waste journey, get a taste of how sustainability and using commonly wasted ingredients doesn’t compromise flavour, but rather elevates it as we close the loop between Bluespoon Bar & Restaurant. Every ending has a start. And in our opinion, the weekend starts on Thursdays, so what better time to close the loop. While our resident Mad Hatters are champions in creating an experience for the eyes as well as for your taste buds, they are further exploring ways in which root-to-leaf bar tending becomes the core of everything they do and we have created lively & innovative Close the Loop Thursdays at Bluespoon to celebrate just that. The creation of conscious craft cocktails at Bluespoon is something to be celebrated! Every first Thursday of the month is now dedicated to fully closing the loop by choosing one ingredient that is commonly wasted in the Bluespoon kitchen and using it as the core of a specialty cocktail, available at the bar for that month. What’s more, this ingredient will be further used to create a perfectly paired bite inspired by the Bluespoon Restaurant menu. We collaborate with a carefully selected different spirit brand each month that shares our values of care, locality and sustainability. The cocktail is then based on this spirit and will be available for the remainder of the month in order to continue using as much of the wasted produce as possible. Back with a bang on April 4th! We’re collaborating with Bakers Best to bring you a new batch of zero waste cocktails. 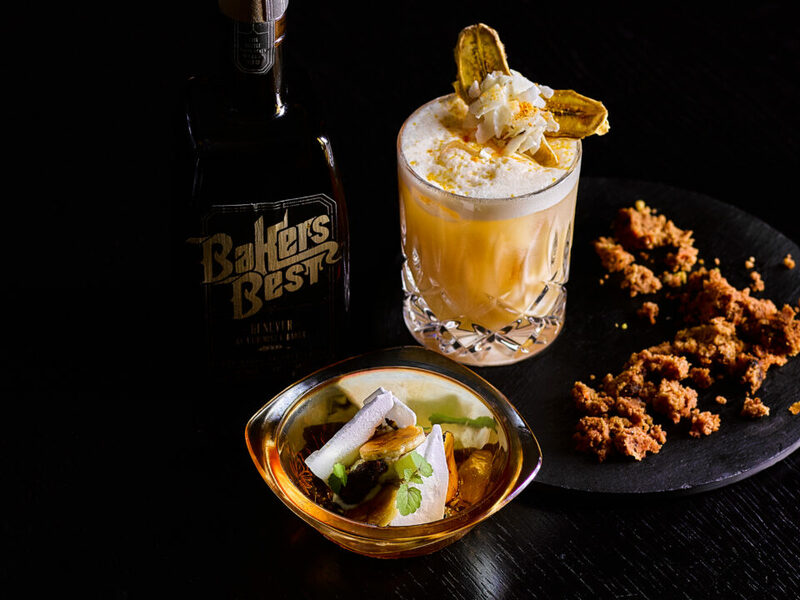 Bakers Best is handcrafted genever made with leftover bread and one loaf at a time, created into an old genever. Local bakeries donate unsold bread, making this genever the perfect sustainable partner for April’s Close the Loop. The Banana Bread Sour is a sweet & sour..well, sour made from Bakers Best genever, ripe fruit, black bananas that would otherwise be thrown away, and coconut milk instead of egg white. It’s pretty much the sweetest way to enter the weekend. Speaking of leftover bananas from breakfast, the kitchen has prepared the perfect pairing using caramelized left over banana, hangop, pecan nuts, chocolate cookie crumble and meringue. Can the 4th of April please come sooner? Join us every first Thursday of the month and see how Head Bartender Martin Eisma and Head Chef Sander Bierenbroodspot dance in perfect harmony to explore the depths of flavour. Check out the recap of our previous events in@bluespoonamsterdam’s Instagram highlights! *Cocktails are €12 and the dish is a complimentary addition to enhance the experience of your cocktail.